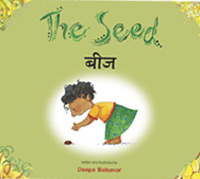 A little girl discovers a seed one day. She puts it in a pot — and then begins the thrill of watching it grow. Will it grow tall? Will it have fruit? Or flowers? The wonder and excitement of emerging new life comes through the minimal text of this skilfully conceived book.